Dr. C. David Remy is an Assistant Professor of Mechanical Engineering at the University of Michigan, Ann Arbor. He received his M.S. degree in Mechanical Engineering from the University of Wisconsin, Madison, a Diploma in Engineering Cybernetics from the University of Stuttgart, and his Ph.D. from the Swiss Federal Institute of Technology (ETH) in Zurich. David is a recent recipient of a 2015 NSF CAREER Award. He is here with us today to tell us all about his journey through life and science. In his free time, David likes to get out and explore the world through travel. His academic degrees are from three different countries, and now that David is settled in the U.S., he likes to spend his time sightseeing with his wife. In Michigan, one of David’s places is replica of a German Beer Garden where you can enjoy the nice summer weather and sample delicious beers. David is a Roboticist. His lab designs, builds, and optimizes robots and devices that walk and help people walk (e.g. exoskeletons and prostheses). As a part of this work, David has developed a keen interest in understanding locomotion in nature. He tries to learn from biology and biomechanics to apply aspects of animal movement when building and controlling robots with legs. David was a curious child who liked to play with Legos and build stuff. He anticipated he would be more of an engineer than a scientist. An early internship spent using x-ray equipment to detect coronary arteries got him interested in biomedical science. David also enjoyed the time he spent working for Mercedes Benz building remote controls for full-scale 40 ton trucks. Throughout his career, David hasn’t really focus on the endpoint, but more on doing what he was interested in and passionate about. This has brought him to the faculty position he holds today. 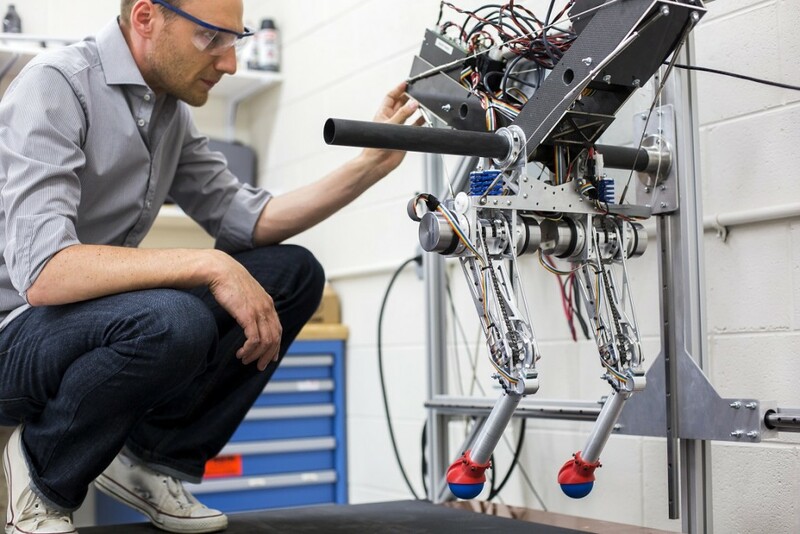 In a previous lab, David spent over five years building prototypes and trying to create a quadrupedal robot that could dynamically walk and run. It was a frustrating iterative process, and after all was said and done, the best he had achieved was a slow, stiffly walking robot. David left the lab and the project to accept his next appointment. Literally two days after David left, the lab got the robot to walk pretty well, and it was sad to watch the videos and know that he had missed seeing the robot’s first steps in person. After accepting his current position, David began building another robot to replicate what they had accomplished in his previous lab group. They have been working on this robot now for over three years just to get it to do everything the other robot could. He running into challenges where things would break and need troubleshooting, but recently they got the robot to walk. This was an exciting success and an important step for his future research. The first conference David ever went to was the best. The destination was a very remote, tiny Finnish island in Baltic Sea. This meeting brings together roboticists and biologists once a year to discuss different aspects of locomotion from a variety of angles. The conference was great, the island was beautiful, and the scientists were able to participate in fun social events together. He actually met some of his future dissertation committee members in a sauna on a sailboat at this meeting. When David was at ETH in Zurich, he and his colleagues had a strong tradition of pulling pranks on each other. They would surreptitiously enroll lab members into obscure professional societies and political parties, and the dissertation defense was a common place to showcase pranks. David shares his elaborate, croissant-filled dissertation prank that really alarmed his colleagues! You can become a better scientist, mentor, and leader by observing people and trying to emulate certain aspects of who they are and what they are doing. The key is not that you want to be a scientist. The key is that you want to do science. Do whatever you enjoy doing. David is the head of the Robotics and Motion Laboratory. His research interests include the design, simulation, and control of legged robots, exoskeletons, and other nonlinear systems. Drawing inspiration from biology and biomechanics, David is particularly interested in the effects and exploitation of natural dynamic motions, the role of different gaits, and the possibility of force/torque controllable systems; both in conceptual models and in hardware realizations. In the long term vision, his research strives to develop systems that reach and even exceed the agility of humans and animals. His goal is to build autonomous robots that can run as fast as a cheetah and are as enduring as a husky, while mastering the same terrain as a mountain goat. At the same time, his will provide us with novel designs for prosthetics, orthotics, and active exoskeletons that help restore the locomotion skills of the disabled and can be used as training and rehabilitation devices for the injured.